NDP candidate Sarah Hoffman is demanding in a letter that United Conservative Party Leader Jason Kenney write a public, sworn response to allegations of voter fraud and irregular campaign donations in the Alberta party’s leadership race. Hoffman’s letter comes the same day CBC News published new allegations of voter fraud in the UCP leadership race, and reported on a letter from election commissioner Lorne Gibson that notified Hardyal (Happy) Mann about the commissioner’s findings that Mann made irregular contributions to Jeff Callaway’s campaign. “Mr. Kenney, is it your contention that Mr. Gibson and the CBC are making false claims in these reports?” reads Hoffman’s letter. At issue is the allegation that Callaway ran a “kamikaze” campaign for the sole purpose of attacking Kenney’s chief rival, Brian Jean, before dropping out of the race and supporting Kenney. 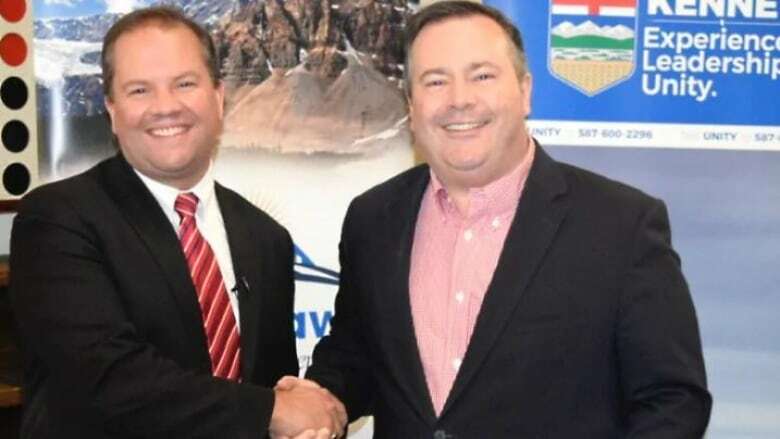 Both Kenney and Callaway deny the allegations, but documents obtained by CBC News show there was deep co-operation between the two campaigns, with high-ranking Kenney officials providing resources, including strategic political direction, media and debate talking points, speeches, videos and attack advertisements. One email in those documents from August 2017 showed Callaway already planned to drop out of the race, something he denies. Hoffman says it shows Kenney has not been honest about his campaign’s role. “He lied, he said there was no involvement and it’s clear there has been involvement from letters between his own campaign and the kamikaze campaign,” she said. Hoffman’s letter and responses to reporter questions appear to conflate the findings of the commissioner with a rundown of claims made by Mann and outlined in the commissioner’s letter. The commissioner did not make any findings on the “kamikaze” campaign or the role of Kenney or his campaign in that effort. Nor did the commissioner come to any conclusions with regard to the voter fraud allegations made by Mann. That was not a finding of the commissioner. What the commissioner did conclude was that Mann knowingly consented to have his name and the name of two other people used on pre-filled contribution forms for the Callaway campaign. Those forms were made out in the amount of $3,000 each, but the money was not Mann’s and did not flow through his bank accounts. Where the money came from remains an open question. On Wednesday, the office of the election commissioner posted a notice of fines against Mann totalling $9,000 — far less than the $30,000 he could have faced. In a formal response to the commissioner, Mann does not dispute the irregular contributions, but claims he was misled by Kenney and his campaign. “I knew what we were doing was tricky, but I never even assumed that these people would risk breaking any laws,” he wrote. Kenney responded to questions about the allegations at a news conference on Wednesday. “I’ve talked about how the leadership election committee had very vigorous rules that we complied with fully, and I’ll just refer you back to the statements made by Robyn Henwood, who’s the chair of the leadership election committee, who has repeatedly confirmed that there’s no evidence of campaigns violating the rules,” he said.